Have you been searching for a low carb keto friendly dairy free ice cream recipe? This keto berry dairy free ice cream is going to end that search once and for all. Did you know there is actually a day set apart to celebrate ice cream? National Ice Cream Day was declared a holiday by President Ronald Reagan back in 1984. I guess you can thank this national day for this low carb dairy free very berry ice cream recipe. Since the arrival of National Ice Cream Day, several big chains across the country have been offering free ice cream the third Sunday of July to pay homage to ice cream. Which is why I decided to share my keto berry dairy free ice cream recipe with you. I wanted to ensure that no one was caving into a large scoop of sugar laden ice cream. Recently, I acquired a lovely ice cream maker just in time to join in on the celebrations. Can I tell you how much fun it’s been to experiment making low carb dairy free very berry ice cream in my new machine? How I survived without a proper ice cream maker for so many years, is beyond me. Summer is open season for ice cream. Who am I kidding we eat ice cream around these parts all year round. What’s more we don’t even need a national day dedicated to ice cream to do so. You should know that not having an ice cream maker did not deter me in making low carb ice cream in the past. In fact, I have already shared a few of them here. However, for a while now I wanted an authentic ice cream texture that only a machine can produce. So when this ice cream maker arrived I was excited to get in my kitchen and start creating. I wanted to make a keto dairy-free option since I have been trying to reduce my dairy intake to see if it further assists me on my journey to wellness. Can I say that going dairy free has proved more challenging than I thought? Thankfully, this keto dairy free berry ice cream didn’t disappoint. Do you have an ice cream maker that has not seen the day of light in a while? 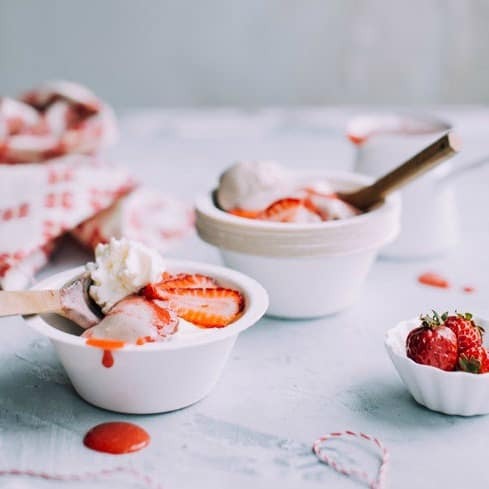 Give this simple low carb dairy free berry ice cream recipe a try and enjoy the process of making your own healthy ice cream. A recipe for keto berry dairy free ice cream. It's the perfect frozen treat for anyone doing a low carb keto diet. Slice your one cup of mixed berries into small pieces. I added cranberries to my mix since I always freeze a few bags in the fall to be able to enjoy in the summer. Toss your berries with lemon juice and sugar substitute. Add the one can of full-fat coconut milk and chocolate pieces and mix well. Add your low carb ice cream mixture into your ice cream maker and use according to your machine’s manufacture instructions. Note that this ice cream will not remain creamy if leftovers are frozen. Hi Vivienne, it just so happens that It turned out the exact color of my lil antique plate. ? thanks for stop on by and commenting. Yay! Let me know what you think once it's done. Enjoy in good health ?